In 2013, the Tamil Nadu government has started a canteen service under the supervision of the chief minister Smt. J. Jayalalitha. Amma Unavagam, the mother (amma) canteen service is basically a chain of restaurants for the under privileged people of the society. In this scheme people who are economically unstable are able to purchase food in much cheaper rates than market price. The state government run scheme, Amma Unavagam has already successfully completed 3 years and still continues to serve a large portion of the state population. The subsidised food service was launched to help the poor people who are unable to purchase food from the market due to high price. 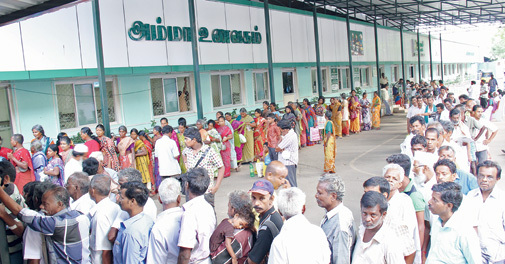 The service was mainly started so that no one in the state of TN is left starved. These restaurants are clean and hygienic. The aim is not only to provide subsidised food but also to maintain clean and hygienic environment so that the people will get fresh and healthy food. There are a lot of opportunities for the women group in the state to grab jobs in these restaurants. Generally the service hires women cook for these food chains. More the outlets, more the job opportunity for the women group of the society. Amma Unavagam is the canteen services by the state government of Tamil Nadu to serve subsidised food to the economically weaker group at much lower price. The canteen service will b supervised by the municipal corporation. At the first place, the municipal corporation of TN had established a number of restaurants in several places across the city Chennai. After Chennai the other cities were targeted and gradually a bunch of restaurants are made under the scheme. There are total 10 canteens found in Coimbatore, among which three of them run by solar-power system. So not only the food is available at lower price but also these canteens are consuming low electricity in the restaurants. The service was started in 2013 and till now there are many a success stories found across the state. A large portion of state population who are economically weak are getting subsidised food at much lower price under this scheme. There is no take away service available under this canteen service. The reason is that the government wants to prevent the resale of the same for profit motive. These restaurants are solely run by the women stuff who belong to self help group. They are being paid Rs. 300/- per day from the government for their services. Beneficiaries under the scheme are the poor people of the state. People who belong to below the poverty line, economically weaker group and low income groups are eligible to avail the scheme. Chennai was the main location where the restaurants started establishing. Covering 200 wards, the food chain has started its service in Chennai since mid of 2013. After the success of Chennai chain, the government has then started their operations in 9 more cities where you will find Amma Unavagam Food Services. More than 20 restaurants can be found across these 9 cities. These locations include Madurai, Tiruchirapalli, Coimbatore, Titucorin, Tirunelveli, Tiruppur, Erode, Salem and Vellore. There are three meals available under this scheme, breakfast, lunch and Dinner. The time of breakfast starts from 7 in the morning and ends at 10 in the morning every day. In the breakfast menu you will get Idly and Sambar and Pongal. In the Lunch that starts from 12 pm and ends around 3pm you will get Curd Rice, Sambar Rice, Curry Leaf Rice and Lemon Rice. In the Diner you will get Chapatis paired with dal or korma. The diner time starts from 6 in the evening and ends at 9 in the night. This canteen service was started in the year 2013 in Chennai. Within 3 months of time the service seemed to be growing and loving be people of the state. A security guard by profession told a leading newspaper that he and his wife had stopped having breakfast at home as the cost is much more for homemade food than this restaurant. On the other an executive officer from a private company praise the Jayalalitha government by saying that poor people can’t purchase food, they can’t even visit hotels to have food. If this food chain wasn’t introduced many of the people would have left starved in the society. State government of Tamil Nadu is still getting massive response from the people from across the state saying the food chain is one of the best schemes that has ever happened to the inhabitants of the state. Another person from EWS depicted that surprisingly the taste of the food is much better compared to the price. Local tea stalls offer Sambar rice at Rs. 7/- per plate while Amma Unavagam offers it at Rs. 5/- per plate. Of course the taste is better in Amma Unavagam than the local tea stalls. The environment and the atmosphere are pretty clean and hygienic which also attracts a lot of people to the restaurant. Though the restaurant chain is serving a large part of the under privileged population but the government had faced huge loss while running the service. The Amma’s canteen is offering food at lowest price i.e. Re. 1/- per plate. That means on an average the service is incurring loss of Rs. 10/- per meal that is Rs. 30/- on daily basis for each person. Now if the half of the state consumes food under this scheme then the loss amount will be nearly Rs. 100 Cr (considering 7 Cr populations in TN). That leads to Rs. 36, 500 Cr loss in a year which is definitely a huge amount for the government. In this case either the government has to cut down the other expenses like salaries of the government employee or raise the price of the food which is not likely to happen. Also there is a huge chance of stealing food by the stuff and administration as it already happened earlier in the mid day meal scheme for the school kids established by Ramchandran a long time back. So with this amazing and subsidised food service the state government is definitely having a lot of financial issues.